Be you a puzzle lover, or just someone on the lookout for another indie title that comes promise you some cat and mouse action, there is a newcomer on Switch that could quite literally be that which you are looking for and its name is BlobCat. 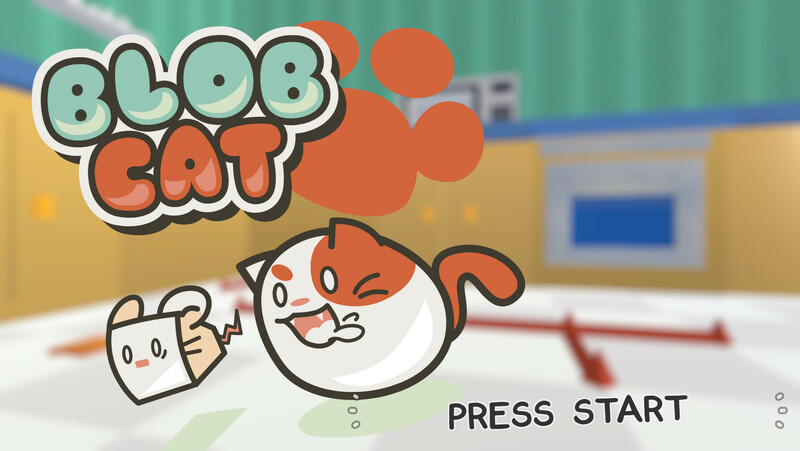 Developed by BySamb and brought to Steam on August 31, 2017, BlobCat is an intriguing puzzle game that can be enjoyed as both a single player title and multiplayer. While the graphics themselves might be a little too much on the cartoony side, you do not need to be a child to be able to enjoy it, but what is the premise how does it play? Well, to answer that, BlobCat is a game more than just about cats as there are also DiceMice and it is down to the player/players (depending on which mode you’re playing,) to keep the DiceMice safe from harm. In order to do that though, across the game’s 6 worlds, players must guide the DiceMice to the awaiting MiceHole, whilst dodging the BlobCats. Sounds easy enough when stated as plainly as that but BlobCat wouldn’t be a puzzle game if things weren’t a little tricky and so, as a way of offering a challenge, should a single BlobCat reach the MiceHole before you can, then you will have to replay the level. Only even then, there is a touch more to it as the single player campaign, is a game of two phases. Upon starting a level, although players can’t actually control the movements of their DiceMice, they can influence them via the placement of arrows, which is all done via the right analog stick, being pushed in the direction you wish your DiceMice would go in. Once you have placed the arrows where you think they need to be, simply press R to enter the second phase and all animals on the field will move. If everything goes right, you’ll complete the level, of which there are 110 to play through and if you did it just right, with the least amount of arrows, you will earn 3 stars that are simply vital. Not only can they earn you some really cool stickers that serve no real purpose, but they will also allow you to gain access to other worlds and the artbook. Should it all go wrong because the faster DiceMice run into a BlobCat, or the BlobCat reached the DiceHole first, players will need to press R again to return to the first phase and try placing arrows in different places before trying again. Just be careful with pressing the L button, since in the first phase, as that resets all arrows you placed and reverts any other changes you’ve implemented on any given level. To BlobCat’s credit, the game does have a decent difficulty spike to it and a fairly engaging singular campaigns thanks to Achievements to earn, each world offering diverse and new locations (especially the Halloween World,) but it is the introduction of new mechanics that really help stand out. Whereas in earlier levels players need only to concern themselves with a minimal amount of BlobCats and DiceMice, the later ones will feature carts that need moving, staircases that can be climbed and even switches that have to be activated to open doors. Some of the levels may prove tediously annoying but with patience, you can and will figure it out, but should you ever desire a break from it, the multiplayer mode is something you should differently check out. Supporting up to 4 players, you can either choose to play with just them, across the 3 available match modes or go online and play against whoever else has the game and cross-play is supported. I may not have been able to play many online games during my time with BlobCat, due to limited rooms against others, but I did play plenty of the local multiplayer mode to earn a decent amount of Mice Coins that I then proceeded to spend in the in-game store to purchases things like an eye patch and a jester hat for my DiceMice. Regardless of what kind of a match you decide to play though, whereas the main campaign can be perplexingly hard at times, multiplayer is pure fun, especially the “Time” matches. The sole purpose of this mode is to save as many DiceMice as you can in the given time you can set for yourself (30-160 seconds) and try to get more than your opponent. Should you direct a BlobCat to your own or someone else’s MiceHole, 10 points will be deducted from your tally and when the meter on the bottom of the screen fills, let’s just say, the real fun begins thanks to a brief change of gameplay that can shut the lights off on you, make things retro and more. As for the other two match types, King of Mice is just like Time, except players can set the number of DiceMice everyone is to try and collect with the first one to do so, being the winner. Then there’s Defend. With Defend, there are more BlobCats and each player has HP. Every time a BlobCat falls into your DiceHole, you will lose 10HP, but should you guide DiceMice to your awaiting safe haven, you will gain HP. Personally speaking, the Time match-type is my go-to stage, but they are almost all equally enjoyable and do help make BlobCat come across as a well-rounded game, especially since it does make use of cross-play. Still, I can’t help but feel a tad disappointed that touch-screen controls weren’t implemented, as I feel they would have benefited BlobCat greatly, when playing alone in handheld mode. In case you have yet to be purr-suaded, while BlobCat may lack hilariously funny cat related puns, once you start playing, it will sink its claws into you and have you experience a paw-sitive gaming experience thanks to appealing gameplay, a decent soundtrack and art style that is suitable for all. But even if you come for the single player campaign, you’ll stay for multiplayer.